New Britain, CT (November 1, 2016) —STANLEY has announced its second round winner and opened third and final round call for nominations of its BUILD YOUR AMERICA 2016 contest, where participants nominate and vote for a USA public charity or private foundation to receive $10,000, and an assortment of Stanley Black & Decker products valued at $1,000 for use in completing a community project. This month STANLEY® is kicking-off its 2016 Build Your America Contest awarding a grand prize to three nominated public charities and/or private foundations. Each grand prize consists of a $10,000 cash award along with an assortment of STANLEY Black & Decker® products to use for the winning projects. In July, STANLEY® will kick off its 2015 Build Your America Contest awarding up to $10,000 to five winning hometown heroes for home improvement or repair projects completed by the House of Heroes. 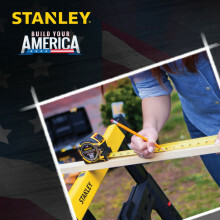 The Build Your America Contest affords STANLEY® the opportunity to give back while promoting the increasing number of hand tools it makes in the USA using global materials.